This role-playing, equestrian title has solid production values and environments. After jumping over the hurdle of challenging navigation, most players should enjoy themselves. The controls can be challenging for younger players at first, but with practice time (like anything else) most players should be able to complete this game, which includes appealing unlockables for the horses and riders. The inventive snow globe-like menu give smooth navigation as well as rotation control for viewing items. The controls, combining the remote and nunchuk, have a learning curve, but don’t require extremely precise movements or a perfect score for success. It’s easy to revert to the analog stick for movement, but producers have made a smooth, balancing act to ease riders through their environments. Your base stance keeps the remote and nunchuk in line horizontally then lifting the remote to go right and the nunchuk to go left. Next, players can even put some body language into their movements through real horse rein actions to speed up (flicking both controls simultaneously forward) or stop (pull both back simultaneously). If that’s too much, game makers offer an easy option of pressing A and B for the same, respective movements. Just find that balance when turning, gradually increase your speed and you’re home free. Easier said than done, especially for some younger players, but that’s why the practice mode and star/balloon mini games, which are instantly available, offer even more motion skill building. Once you’ve mastered the moves you can change camera views between first person and third person (C button on nunchuk) or rotate the camera a bit (no 360 pans here). Once players are oriented, the tutorial and optional coaching comments can continue the sense of accomplishment/guidance, though the tall, thin fonts decrease the overall readability of text instructions/hints. The tutorial/announcer voices are clear and encouraging while background noises of nature and crowd noise provide some mild enhancement. Players can also replay their rides to catch mistakes and enjoy good moves. The completion of each task opens up new clothing, equipment, etc. The graphics are smooth and offer indoor and outdoor environments. Role playing elements like overall care and grooming of the horse are included, but it’s the accomplishments that really drive this game. Good use of time management and knowledge of horse terms aren’t necessary, but certainly help reduce the learning curve. A moderately replayable and very affordable title complete with turned based multiplayer mode, also instantly available, for up to four players. The seven mini games include an environmental hide and seek, which hones the player’s skills to pick out bonus items quickly. Great skill building and constant rewards really encourage players to jump past obstacles and patiently practice. A high value game promoting learning and problem solving, backed by a smooth system/controls that keeps the frustration level low. 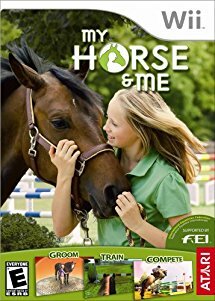 This entry was posted in Video Game Reviews and tagged horse, Michael Siebenaler, Mike Siebenaler, My Horse and me, Nintendo Wii, Tall Writer, video games, Wii. Bookmark the permalink.